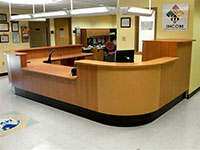 AMCASE is a Woman Owned Small Business (WOSB) modular furniture company in Winston-Salem, NC. 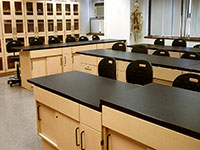 We serve the healthcare, government, education, and commercial industries by providing sustainable casework products such as nurse stations, pharmacies, labs, modular walls, transaction counters, and office area applications. AMCASE is an all-in-one facility – all design, engineering, project tracking, manufacturing, and assembly is accomplished under one roof, which allows us to keep costs competitive for the end-user and provide exceptional service for our customers. Other: We offer customized casework solutions, provided the quantities are sufficient, for the occasion where our 10,000 standard cabinets isn't quite what you need. Our on-site manufacturing plant allows us to provide this service to our customers.